"King of Rock and Roll". Uniquely successful in many genres of music - Rock and Roll, Gospel, Country and Blues, by distinctively fusing the styles of "white country and black rhythm". ** Inductee of 4 Halls of Fame - Rock and Roll (1986), Rockabilly (1997), Country Music (1998), and Gospel Music (2001) Halls of Fame. Best selling artist in solo category (600 million - 1 billion sales worldwide), and holds records for concert attendance and TV ratings as well. What is Inspiring in Elvis Presley Biography? His rise to world fame from his humble beginnings in poverty, with no formal music training, from the shy and often bullied kid and teen that he used to be. Elvis was born in a two room shack in Mississippi, U.S, and later grew up in a relative's boarding house in Memphis, with a bathroom shared with three other families. His family was on the border of poverty line, living on welfare. To supplement family income, he worked various jobs, including as an usher in a local theater, and later as a truck driver. As a kid, and later as a teen, Elvis was known to be very shy, and was often bullied by kids at school for being a mama's boy, and for his wild, flashy dress style and facial get up, and also for playing trashy, "hillybilly" music. But he realized music was his passion at a young age, and used to practice in the laundry room, with a guitar that was presented to him. And young Elvis also used to spend time in record stores that had jukeboxes and listening booths. Elvis started attending recording sessions from 1953 when he was 18, and was turned down several times on the grounds that he couldn't sing. And when he did get second chances, there were occasions when he just froze or messed up the auditions due to stage fright! By persisting hard enough, Elvis eventually got his chance with Sun Records in 1954, but the initial performances were not well received as his music was difficult to be categorized. He got his break in 1956 when the recording company RCA started promoting him, and his Heartbreak Hotel topped U.S. charts, and sold more than 1 million records. Presley's versatile voice, his ability to play by the ear and imitate anything he heard once or twice, and of course, his controversial on stage dance steps which drove the young into frenzy, were are also credited to his extraordinary success. In 1971, Elvis Presley was honored as "One of the Ten Outstanding Young Men of the Nation" by U.S. Junior Chamber of Commerce, and there is also a highway named after him as "Elvis Presley Blvd" in Memphis.In his lifetime and beyond, Elvis Presley was the inspiration for several popular rock and pop musicians. Starting from 1958 itself, several singers who imitated Presley's style have successfully risen to prominence. 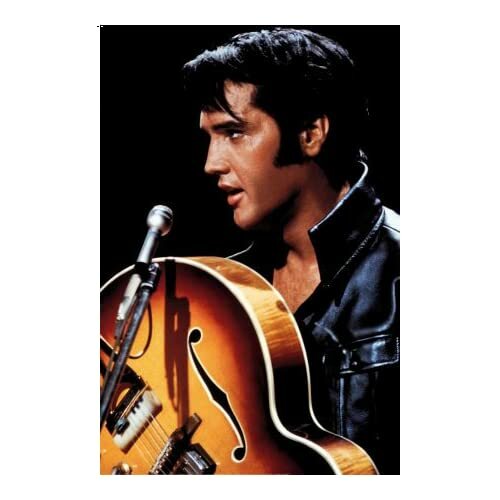 With 100 Elvis' songs in 4 discs, Elvis 75-Good Rockin' Tonight is turning to be one of the most popular and fast selling CD products, and should be a treat for Elvis' fans the world over!